Clay worked at Twelve Corners regularly from 1998 until 2002 during high school and his summers home from college. He is a graduate of Western Kentucky University with a degree in Horticulture. After college, Clay worked in Owensboro, Kentucky as a landscape designer and crew manager before moving back to Gallatin to start his own landscaping company. Owning a nursery has always been a dream of Clay's and he could not pass up the opportunity to carry on the legacy of one so close to his heart. Clay’s Corner consists of topics that he finds interesting or issues that are brought to him through the nursery. Amur Maackia is a deciduous tree similar in look to a locust. It has a nice cinnamon color to its bark as it ages. It is very cold hardy due to originating in the Amur River basin between Siberia and Russia. Karl Maackia was an early Siberian explorer to which the tree gets its genus name. We carry a variety of Hybrid Tea, Floribunda, Grandiflora, and Climbing Roses. The Rio Samba is a standard at 12 Corners Nursery. Its flowers are golden yellow that transition to beautiful scarlet accents. Its disease resistance makes it stand out as one of the longer lasting Hybrid Tea Roses. 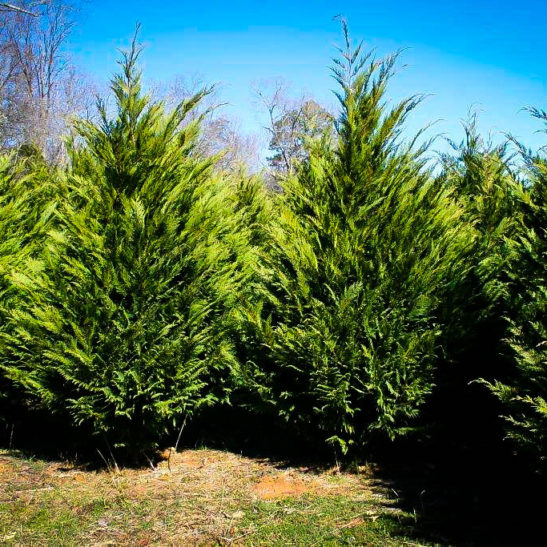 This cypress is a great screening evergreen tree that holds up well to storm damage and tolerates wet conditions better than the Leyland cypress. Its tough statue was selected by a Christmas tree farmer in Georgia, Bill Murray, from whom it attained its name.